AS IT STANDS: If Trump Is Elected, How Many People Will Heed Obama's Call To Live On Mars? 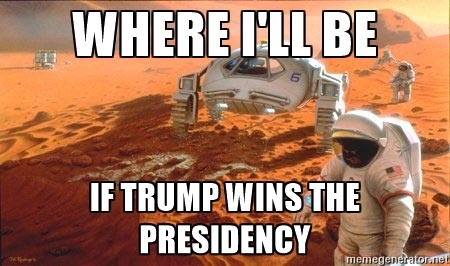 If Trump Is Elected, How Many People Will Heed Obama's Call To Live On Mars? For months now, I've heard people make comments like, "If Trump is elected I'm moving to Canada." That could be because Canada is on our border, and it's easier to stay in contact with family and friends from there. But consider this; it means you'll be closer to a Trump regime that may invade Canada over angry twitter remarks with Canadian politicans! There is one alternative however. Yes, it's a long shot. I warn you it'll take time, and you'll have to be careful what you say in public meanwhile about Trump or his "Trumper Undercover Squad" will take you down like a fat chick in a beauty contest. Sign up to go to Mars. There's several commerical spaceflight companies that have announced plans to aim for Mars. Boeing's CEO is convinced his company will be the first to reach Mars. Blue Origin, owned by Amazon founder Jeff Bezoz, has declared a Mars venture, and the space contractor Orbital ATK have plans to send humans to Mars. The one you should check into would be the Dutch venture called Mars One, which is shooting for a 2025 launch date to the Red Planet. Don't worry. They've been taking applications for years, and still are. I expect if Trump gets in office the only way he'll leave is if there's a civil war. So, that 2025 launch date might be perfect timing.